A meeting today of EU transport ministers agreed to back a change to rules on cross-border enforcement of traffic offences such as speeding. The European Commission published a revised cross-border enforcement law in July. The proposal was launched in response to a European Court of Justice ruling in May that said the existing rules (which only came into force in November last year) were adopted on an incorrect legal basis. The ECJ has said the current law could remain in effect until May 2015 while new legislation is agreed. Antonio Avenoso, Executive Director of the European Transport Safety Council said: "These rules mean that foreign-registered drivers are no longer able to ignore traffic laws safe in the knowledge that they won't be penalised when they return home. They are a smart way of deterring people from dangerous driving when they go abroad but will also help member states follow up on traffic offences when drivers put other people's lives at risk." This comes on the heels of an Institute of Advanced Motorists report that 23,295 oversees drivers escaped UK speeding penalties since January 2013 – the equivalent of £2.3 million worth of speeding tickets. 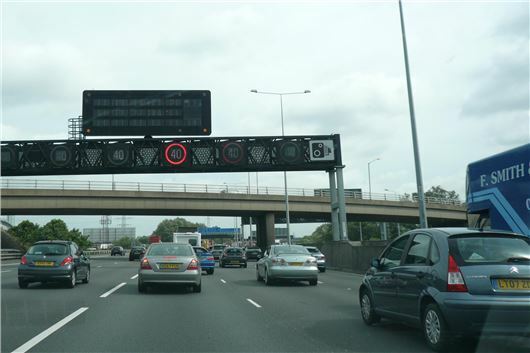 The IAM figures were revealed following a freedom of information request to police authorities, which asked how many oversees motorists had been caught by speed cameras across England and Wales. As foreign vehicles are not registered with the DVLA and there was confusion over cross border tracing, these speeding offences were not pursued. But now they can be. The Metropolitan Police that covers 32 London boroughs followed in at sixth position with a recorded number of 1,586 offences taking place across the Greater London area, with a high speed recording of 98mph on the A406 North Circular Road, southbound – a 50mph zone.